This year’s ALCI Conference was an extra special one, as it was the 25th Anniversary of both ALCI and of International Board Certified Lactation Consultants (IBCLCs) in Ireland. The Conference was opened by Writer and Journalist Victoria White, whose address was both funny and thought provoking. Outgoing ALCI President Margaret Murphy IBCLC took the opportunity to officially launch this, the new ALCI website, and the new logo. She made a presentation of a bronze motherhood figurine to longest serving IBCLCs Sue Jameson and Genevieve Becker, who were founding members of ALCI and have been IBCLCs for 25 years. 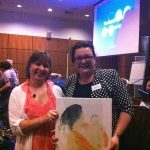 Margaret then became the recipient of a gift, as incoming ALCI President Meabh Anne McNamara IBCLC made her a presentation of the traditional ALCI Council Retirement gift, which is a beautiful canvas with a mother and infant image. The education sessions began then, with Keynote Speaker Denise Altman IBCLC taking to the podium. 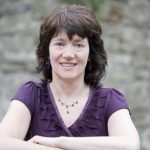 She was joined by many other presenters over the two days including Lorraine O’Hagan IBCLC, Dr. Roy Philip, Siobhan Hourigan (National Breastfeeding Co-Ordinator) Ger Cahill IBCLC and Nicola O’Byrne IBCLC. Saturday also saw the ALCI conference once again hosting the Quintessence Breastfeeding Challenge. Friday night saw a party in the hotel with past and current ALCI members and supporters enjoying a hilarious table quiz, and a beautiful birthday cake for ALCI .